You are here: Home / News / Really, Barack Obama Not Embarrassed by His Scandals? Really, Barack Obama Not Embarrassed by His Scandals? (ThyBlackMan.com) When Barack Obama spoke at the 12th annual MIT Sloan Sports Analytics Conference in Boston, MA, many of us scratched our heads as to why the event was off-the-record. No photography, recording, or social media posting about Obama’s appearance was allowed. Obviously, he would not be talking about golf. But, with over 3,500 people in attendance, there was no way this speech would be hidden for long. As expected, a recording of Obama’s appearance was leaked. Obama said a lot of things over the course of an hour, but I’d like to focus on his claim that, while some people in his administration made mistakes, “We didn’t have a scandal that embarrassed us.” This was not the first time Obama claimed his administration was devoid of scandal. Before leaving office he claimed his administration was “probably” the first “in modern history that hasn’t had a major scandal in the White House.” Others in his administration have echoed this “scandal-free” narrative like a coordinated chorus hoping, after repeating it often enough, the people would believe it was true. The sad thing is, many people do believe it. Obama’s claims always come with a subtle caveat. His administration didn’t have “a scandal that embarrassed us,” or they didn’t have “a majorscandal.” But, my favorite nuance from his super-secret appearance in Boston was when he said, “Generally speaking, you didn’t hear about a lot of drama inside our White House.” He’s right about that point. As I document in my forthcoming book, The Scandalous Presidency of Barack Obama, there were over two dozen scandals over the course of Obama’s presidency, and they were all downplayed or ignored by the mainstream media. Soon after Barack Obama was elected, his presidential transition got caught up in a scandal surrounding the attempted illegal “sale” of his former Senate seat by former Illinois Governor Rod Blagojevich, who wanted to profit from what he called “a [expletive] valuable thing.” Obama denied having any involvement in discussions about who might be appointed to replace him, yet he had a wish list of replacements that even included his advisor Valerie Jarrett—whom Blagojevich was willing to nominate in exchange for his being appointed to Obama’s cabinet. Obama also met with Blagojevich to discuss his Senate seat in a meeting about which a local CBS affiliate published two stories, only to remove both off their website after the scandal broke. This scandal could have undone the Obama presidency before it even started, but after Obama’s historic victory, that was the last thing the media would do, a trend that would continue throughout his presidency. The media protected Obama from criticism and controversy as aggressively as the Secret Service protected him from danger. But that doesn’t change the fact that Obama’s presidency was the most scandalous in history. Obama may not be embarrassed by Fast and Furious, Benghazi, the IRS scandal, the VA scandal, Solyndra, the OPM hacking scandal, the GSA scandal, the Iran Ransom scandal, Uranium One, or the FISA abuse scandal currently being unraveled, but he should be. And the media should be embarrassed at how they failed the American public by pretending these scandals didn’t exist, or weren’t important. Obama has now been out of office for more than a year and we’re stilllearning dirty details about his presidency. In December of last year,Politico published the bombshell report about how the Obama administration stonewalled an investigation of an international drug-trafficking operation of the Iran-backed terror group Hezbollah in order to protect his nuclear deal with Iran. The media outright ignored the story. ABC, CBS, and NBC considered this scandal unworthy of coverage. The Mueller investigation has exposed more about how politicized the Department of Justice became under Obama than it has exposed any collusion between Donald Trump and the Russians, not that the media has taken any interest in that. Despite a presidency more corrupt than Richard Nixon, many in the media had the gall to claim, upon Obama’s leaving office, he had a “scandal-free presidency.” Paul Blumenthal claimed at The Huffington Postthat while scandal “has consumed the final four years of every two-term president in modern history […] Barack Obama’s administration is the exception.” David Brooks wrote in the New York Times, “Obama administration has been remarkably scandal-free.” Such laughable claims have persisted, and many on the left still make and believe this claim. Back in September, liberal CNN commentator Bakari Sellers described Obama as “eight years scandal-free.” Trust me, there are many more shameful examples. So, when Obama says, “Generally speaking, you didn’t hear about a lot of drama inside our White House,” he wants us to believe that if the media didn’t report on it then it didn’t happen. When the media refuses to give us the full knowledge of the character and conduct of our rulers, we get Barack Obama for eight long years. The media presented Obama as a successful, scandal-free president—a massive cover-up unprecedented in the history of modern journalism—and this amounts to an abdication of their duty to the American people to tell us the truth. We expect the free press to serve as an important check on the government. Their failure to do so with Barack Obama is his golden ticket to historical greatness and he clearly recognizes this and is using it to his advantage. John Adams once wrote, “Liberty cannot be preserved without a general knowledge among the people, who have a right […] to that most dreaded and envied kind of knowledge, I mean, of the characters and conduct of their rulers.” The media denied us the knowledge of Obama’s character and conduct and will continue to do so. 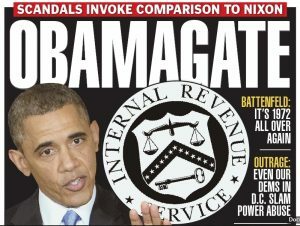 If we don’t shine the light on the facts of Obama and his presidency now, the myth of a “scandal-free” Obama administration will be written as fact for the history books. How long will liberty last if our leaders—and I mean all of them, regardless of party—aren’t held accountable? Thank you for telling it like it is. I appreciate the truth when I read it. The Cointel Pro author of this article just can’t accept that Obama fixed the awful economy, cut the unemployment rate in half for blacks, bailed out companies which saved jobs, used diplomacy instead of war and was a better president ten times over than Trump on his very best day. So you try to tear him down. Yes he made mistakes but for a novice, he did much better than any novice president in the last 50 years. Now choke on the facts, not the Trump type alternative facts. Fake news? This article is fake news. Just a troll plugging a book.